Cross-Scale was proposed by the scientific community in response to a call from ESA, in 2007, for new missions for the Cosmic Vision 2015-2025 programme. By investigating the process of plasma coupling in near-Earth space on different temporal and spatial scales this medium-sized (M-class) mission would address one of the core themes of Cosmic Vision: How does our Solar System work? As one of six M-class candidate missions selected for further consideration after this first call, Cross-Scale was subject to assessment studies by ESA and by two independent industrial consortia (EADS-Astrium and Thales Alenia Space). In early 2010 the advisory body structure of ESA’s Science and Robotic Exploration Directorate met to consider the outcome of these studies. Cross-Scale was not selected to continue to the next phase. 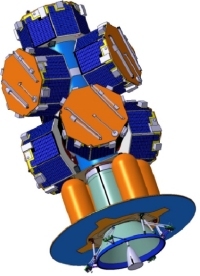 From left to right: The 7 Cross-Scale spacecraft, mounted on their dispenser, as proposed by EADS Astrium, UK (Credit: EADS Astrium); Individual Cross-scale spacecraft, from the EADS Astrium (above) and Thales Alenia Space (below) proposals; The 7 Cross-Scale spacecraft, mounted on their dispenser, as proposed by Thales Alenia Space. The aims of the Cross-Scale mission fell under the “How does our Solar System work?” theme of Cosmic Vision, in particular focussing on plasma physics within our local neighbourhood. Under this umbrella would have fallen three main areas of focus: shock waves, magnetic reconnection and turbulence. In situ studies of plasma within the heliosphere, remote sensing of the solar surface and more distant astrophysical objects, along with theoretical modelling, have shown that these processes operate and play pivotal roles throughout the Universe. Shock waves are important locations for the transfer of directed bulk flow energy into heat; reconnection releases stored magnetic energy to the plasma in the form of both heat and accelerated particles, a process that can provide the overall driving force for the dynamics of solar plasma; turbulence transports energy from large scales at which it is input to small scales where it is dissipated. These three phenomena occur over distinct spatial scales – electrons, ions and fluids. Cross-Scale, as the name suggests, was designed to be capable of spanning these different scales. In order to tackle this challenge the mission was set to consist of seven spacecraft flying in two nested tetrahedra. This configuration would have allowed researchers to simultaneously measure phenomena over the electron and ion scales. 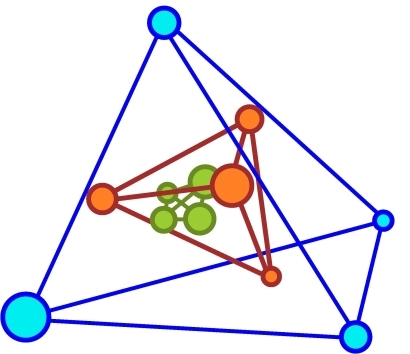 To include the third, fluid, scale it was also proposed that Cross-Scale could operate in coordination with the five spacecraft of the proposed JAXA/CSA SCOPE mission, forming a triple nest of tetrahedra. In total, twelve different types of instruments would have flown aboard Cross-Scale, some of which built upon the heritage established by previous missions including ESA's Venus Express and Cluster. Some instruments would have been carried on every spacecraft, with others only featuring on a few depending on the scale in question. 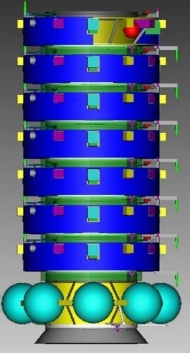 Two European industrial consortia, one led by EADS-Astrium, the other by Thales Alenia Space, provided assessment studies on behalf of ESA for the design of the individual spacecraft in order to accommodate this instrumentation. The seven spacecraft would have been launched aboard a Soyuz-Fregat rocket for a mission lasting a minimum of two years. Once inserted into an orbit inclined 14 degrees to the Earth's equator, the spacecraft's distance from Earth would have varied between 10 – 25 Earth radii. This would have allowed it to pass through key areas of interest in space plasma physics, including the bow-shock on the day side of the Earth and the area of reconnection at the magnetopause. Further details about the Cross-Scale mission can be found in the links in the right-hand menu.